The Ferrari F40 changed the world of motoring for the better. Way back in 1987, Ferrari unleashed the F40 on the world in celebration of the company's 40th anniversary. It was the fasted and most powerful Ferrari they had ever produced – pushing out 352kW from its 3.0-litre powerplant, it was arguably the first true supercar. It was also the last Prancing Horse to be personally approved by the great Enzo Ferrari with 400 scheduled for manufacture. Even though it was also Ferrari's most expensive vehicle at the time, with a starting price of US$400,000, demand was so high that a total of 1,211 F40s were eventually manufactured. Apparently, some buyers reportedly paid upwards of US$3 million dollars for them. Without going into too much history, Enzo wanted to leave a legacy with his final supercar. As the FIA had just canned Group B racing, he was left with five 288 GTO Evoluzione that had been manufactured to compete against the Porche 959 at the time. Not content to put the dream to sleep, he commisioned the Evoluzione engineers to produce a car exclusively for road use, while Pininfarina would take care of the design. 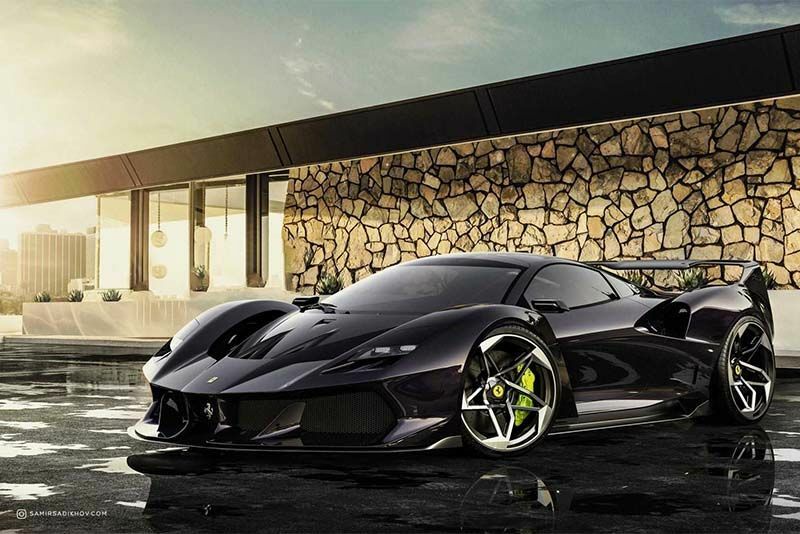 According to a spokesperson from the Ferrari marketing department, "We wanted it to be very fast, sporting in the extreme and Spartan. Customers had been saying our cars were becoming too plush and comfortable. "The F40 is for the most enthusiastic of our owners who want nothing but sheer performance. It isn't a laboratory for the future, as the 959 is. It is not Star Wars. And it wasn't created because Porsche built the 959. It would have happened anyway." Out of this, the Ferrari F40 was born, and the rest is history. When a vehicle like the F40 comes along, filling the walls of kids' bedrooms and petrolheads' garages, it reaches iconic status. And it's almost inevitable that there will be tributes, like this one by Samir Sadikhov. Samir, a Transportation Designer designer from Genesis Motor America, spent a year in his free time to create a 30-image gallery of the F40 for the 21st century. He says; "For car designers like us, the F40 is a design icon. Its combination of racing genes and minimalism generates an engaging aesthetic that continues to win hearts even today. I wanted to give a design tribute to the F40. "As a petrolhead and a car designer, I wanted to keep the spirit of the F40 icon. I spent more than a year to work on the exterior and interior design and added some extra time for the monocoque structure as a design study." All we can say is that the images in the gallery above speak for themselves. The attention to detail is glorious and the result is simply jaw-dropping. Find out more about the Ferrari F40 Tribute by Samir Sidikhov here.